Water for the thirsty, rest for the weary, and a friend for the lonely. Three books in one, bringing you closer to the Savior. In Come Thirsty, Max Lucado encourages you to visit the well and drink deeply, to receive Christ's work on the cross, the energy of his Spirit, and his lordship over your life, and his unending, unfailing love. Using the illustration of weary travelers in Traveling Light, Lucado invites us to release the burdens of our excess baggage that we were never intended to bear--with the Twenty-third Psalm as our guide. 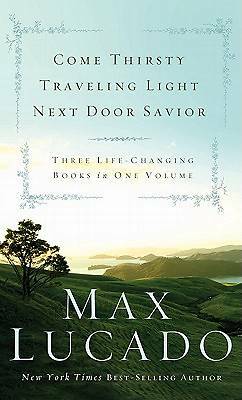 In Next Door Savior, master storyteller Max Lucado presents the life of Jesus Christ in stunning contrast, revealing the irresistible human qualities and the undeniably divine characteristics of Jesus. Lucado describes, as only he can, a Savior who is as approachable as a next-door neighbor, yet mighty enough to save humanity.